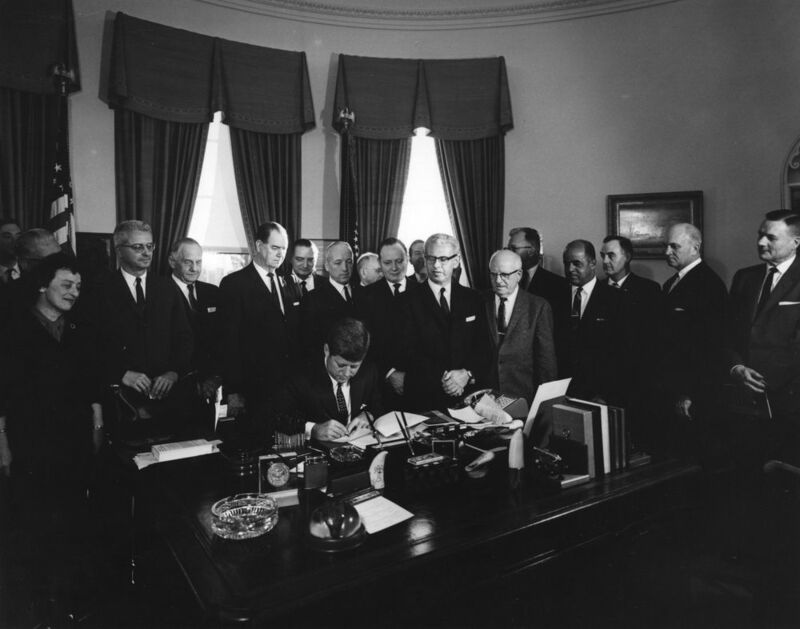 Fifty years ago, on January 17, 1962, Federal employees first obtained the right to engage in collective bargaining through labor organizations when President John F. Kennedy issued Executive Order 10988, "Employee-Management Cooperation in the Federal Sector." Executive Order 10988 issued as result of the findings of the Task Force on Employee-Management Relations in the Federal Service, which was created by a memorandum issued to all executive department and agency heads by President Kennedy on June 22, 1961. In this memorandum the President noted that, "The participation of employees in the formation and implementation of employee policy and procedures affecting them contributes to the effective conduct of public business," and that this participation should be extended to representatives of employees and employee organizations. The Task Force wishes most emphatically to endorse the President’s view that the public interest calls for strengthening of employee management relations within the Federal Government. A continuous history, going back three quarters of a century has established beyond any reasonable doubt that certain categories of Federal employees very much want to participate in the formulation of personnel policies and have established large and stable organizations for this purpose. This is not a challenge to be met so much as an opportunity to be embraced. Executive Order 10988 gave Federal employees the right to join, form, or assist labor organizations. It established a three-tiered system of recognition: exclusive representation, formal recognition, and informal recognition. For unions designated by a majority of employees in a unit, agencies would be obligate to negotiate over terms and conditions of employment with the exclusive representative, and to allow it to attend formal meetings. In units without an exclusive representative, the agency would have to accord formal recognition to unions representing more than 10 percent of the unit and to "consult with such organization from time to time in the formulation and implementation of personnel policies and practices, and matters affecting working conditions that are of concern to its members." The agency would also have to informally recognize all unions, regardless of whether another union was the exclusive representative, and allow them "to present to appropriate officials its views on matters of concern to its members." · Through labor-management consultation and negotiations, improved personnel policies and working conditions have been achieved in a number of areas. Based on the report and recommendations of the Presidential Review Committee, in 1969 President Nixon expanded the rights provided under Executive Order 10988 issuing Executive Order 11491, which established an institutional framework to govern labor-management relations in the Federal Government, set forth specific unfair labor practices, and authorized the use of binding arbitration of certain disputes. Like Executive Order 10988, the Order contained provisions reserving certain rights to agency management. Executive Order 11491 also established two new entities. One, the Federal Labor Relations Council (Council), would oversee the entire program; make definitive interpretations and rulings on provisions of the Order; decide major policy issues; hear appeals, at its discretion, from decisions made by the Assistant Secretary of Labor for Labor-Management Relations on unfair labor practice charges and representation claims; resolve appeals from negotiability decisions made by agency heads; and decide exceptions to arbitration awards. The other, the Federal Service Impasses Panel, was given discretionary authority to assist parties in resolving bargaining impasses when voluntary arrangements failed. In 1975, based on the "Report and Recommendations of the Federal Labor Relations Council on the Amendment of Executive Order 11491," President Gerald R. Ford issued Executive Order 11838 amending the Nixon Executive Order and directing, among other things, the additional expansion of collective bargaining rights to include agency regulations and mid-contract changes, enhancement of third-party dispute resolution procedures, and union recognition by secret ballot election. By 1977, President Jimmy Carter had determined that comprehensive reform of the civil service system -- the first since the Pendleton Act of 1883 -- was necessary. The Congress agreed and, after extensive hearings, passed the Civil Service Reform Act of 1978. One title of that Act -- Title VII, which specifically addressed labor-management relations and established the authority of the Federal Labor Relations Authority (FLRA) -- engendered particularly heated debate. Eventually, Title VII of the bill before the House of Representatives was replaced by a substitute amendment proposed by Rep. Morris K. Udall. Members of Congress previously opposed to the initial legislation that contained a broad management rights provision supported the amendment, based on an understanding that the provision would be "narrowly construed" and would, "wherever possible, encourage both parties to work out their differences in negotiations." (Rep. Ford, 124 Cong. Rec. H9648). The House passed the "Udall Substitute," the Senate agreed to the conference report embodying that amendment, and President Carter signed Title VII, the Federal Service Labor-Management Relations Statute (Statute), into law as part of the Civil Service Reform Act on October 13, 1978, effective January 11, 1979. (2) the public interest demands the highest standards of employee performance and the continued development and implementation of modern and progressive work practices to facilitate and improve employee performance and the efficient accomplishment of the operations of the Government. Therefore, labor organizations and collective bargaining in the civil service are in the public interest. The actual establishment of the FLRA was effected by the Reorganization Plan No. 2 of 1978, which took effect on January 1, 1979, 10 days before the Statute became law. The legislative negotiations that resulted in Title VII and established the FLRA were complex. · The Statute made the Authority's final orders -- which are issued in unfair labor practice and negotiability decisions -- subject to judicial review. · Changing the nature and scope of reserved management rights and the exceptions to those rights. The jurisdiction defined for the newly-created FLRA extended throughout the world to wherever Federal agencies covered by the Statute are located. Subsequent legislation further expanded the list of entities within FLRA's jurisdiction. For example, the Panama Canal Act of 1979 extended FLRA's jurisdiction to cover employees, including foreign nationals, of the Panama Canal Commission and U.S. agencies in the Panama Canal Zone, although this jurisdiction was terminated as of July 1, 1998. More recently, the Presidential and Executive Office Accountability Act extended coverage of the Statute to additional categories of employees of the Executive Office of the President. Coverage also has been modified over the years by Presidential Orders issued pursuant to § 7103(b) based on national security determinations. In November 1979, President Carter excluded a number of agency subdivisions, principally in the Department of Defense and Department of the Treasury. Subsequently, President Reagan suspended the program with respect to certain overseas activities, and exempted specific divisions of the Drug Enforcement Administration and the United States Marshall's Service from the Statute's coverage. Through subsequent legislation, Congress expanded the responsibilities of components of the FLRA. For example, the Foreign Service Act of 1980 established a labor-management relations program for the members of the U.S. Foreign Service. The Chairman of the FLRA also heads the Foreign Service Labor Relations Board and appoints its members and the members of the Foreign Service Impasse Disputes Panel; the FLRA General Counsel serves as General Counsel to the Board; and the Chairman of the Federal Service Impasses Panel serves as a member of the Foreign Service Impasse Disputes Panel. In 1982, the Federal Service Impasses Panel gained authority to rule on negotiation impasses regarding alternative work schedules. And, in 1994, Congress assigned the Authority specific responsibilities concerning the certification of bargaining units resulting from reorganizations within the Department of Agriculture. Since the enactment of the Statute in 1979, Federal service labor-management relations has been impacted by the issuance of various Executive Orders. In 1993, President William J. Clinton issued Executive Order 12871, "Labor Management Partnerships," which called for a new form of Federal labor-management relations so that managers, employees, and employees’ elected union representatives would serve as partners in designing and implementing comprehensive changes necessary to transform Federal government agencies into organizations capable of delivering the highest quality services to the American people. That Order was later rescinded by Executive Order 13203, "Revocation of Executive Order and Presidential Memorandum Concerning Labor-Management Partnerships" that was issued by George W. Bush in 2001. Federal employees and their union representatives are an essential source of front-line ideas and information about the realities of delivering Government services to the American people. A nonadversarial forum for managers, employees, and employees’ union representatives to discuss Government operations will promote satisfactory labor relations and improve the productivity and effectiveness of the Federal Government. Labor-management forums, as complements to the existing collective bargaining process, will allow managers and employees to collaborate in continuing to deliver the highest quality services to the American people. Management should discuss workplace challenges and problems with labor and endeavor to develop solutions jointly, rather than advise union representatives of predetermined solutions to problems and then engage in bargaining over the impact and implementation of the predetermined solutions. For half a century and today, Federal labor-management relations contributes in large measure to a high performing, dynamic and diverse public sector workforce and effective public business. Links to historical documents cited above can be found here. To download a copy of the Commemorative Poster, please click here.